The Environmental Working Group (EWG), publishers of the repeatedly debunked dirty dozen list and promoters of the myth that vaccines cause autism, have released data assuring that many popular oat-based breakfast items including Cheerios and Quaker Oats squares tested for glyphosate at “levels well in excess of EWG’s health benchmark.” Does this report mean you need to switch to "non-gmo" cereal? Let’s explore some facts about glyphosate and the food you eat. Wheat (and therefore oats) is not commercially available as a GMO crop anywhere in the world, but some farmers do use herbicides containing glyphosate to treat wheat crops. Why? Because of how glyphosate works. Glyphosate is an active ingredient in many herbicides, including Roundup. Glyphosate is preferred by many farmers because it is extremely effective with only very small amounts needed to provide desired results, has a low toxicity (lower even than table salt), and it has a short life as an active compound in the environment. Which crops are GMOs? There are just 10 GMO crops commercially available in the U.S. But why would there be ANY weed-killer in your child’s bowl of Cheerios? Even at the highest level reported by the EWG (2,837 ppb), an adult would have to eat 81.5 pounds of the oat breakfast cereal every day for the rest of their life to reach the strict limits set by the EPA. Do GMOs increase the use of pesticides? The answer might just surprise you. But even though the pesticide residues are well below widely accepted limits, the concern about illnesses like cancer remain. Will glyphosate residues in cereal cause cancer? The answer is simply this - no. Glyphosate was classified by IARC as a group 2A carcinogen—the same classification given to emissions from high temperature frying, work exposure as a hairdresser, manufacturing glass, and burning wood. IARC only assesses hazard, not risk. What’s the difference? It’s quite simple: a hazard has the potential to cause harm; a risk is the chance you will be harmed. Most notable health organizations around the world disagree with IARC’s findings about glyphosate as a carcinogen, including the EPA, the German Risk Agency, and WHO— which IARC is an agency inside of. GM foods currently available on the international market have passed safety assessments and are not likely to present risks for human health. In addition, no effects on human health have been shown as a result of the consumption of such foods by the general population in the countries where they have been approved. For more information about why farmers use glyphosate, read Glyphosate as a Tool. To learn more about the 10 GMO crops on the U.S. market, visit our GMO 101 page. 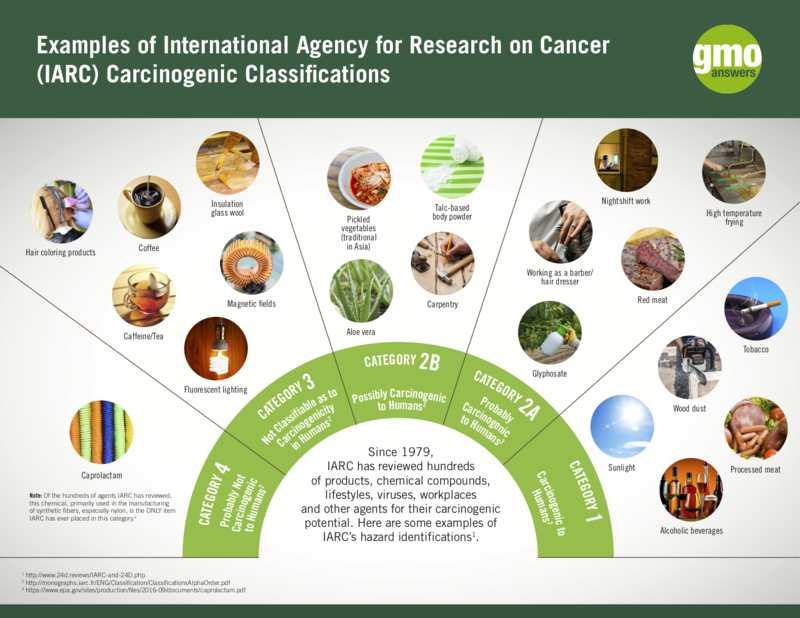 If you have more questions about IARC’s classification of glyphosate as a Group 2A carcinogen, read our overview to learn what this means for you.